The Blackridge House by Julia Martin, published by Jonathan Ball Publishers. Elizabeth Madeline Martin spends her days in a retirement home in Cape Town. Bedridden, her memory fading, she can recall her early childhood spent in a small wood-and-iron house in Blackridge on the outskirts of Pietermaritzburg. Though she remembers the place in detail, she has no idea of where exactly it is. 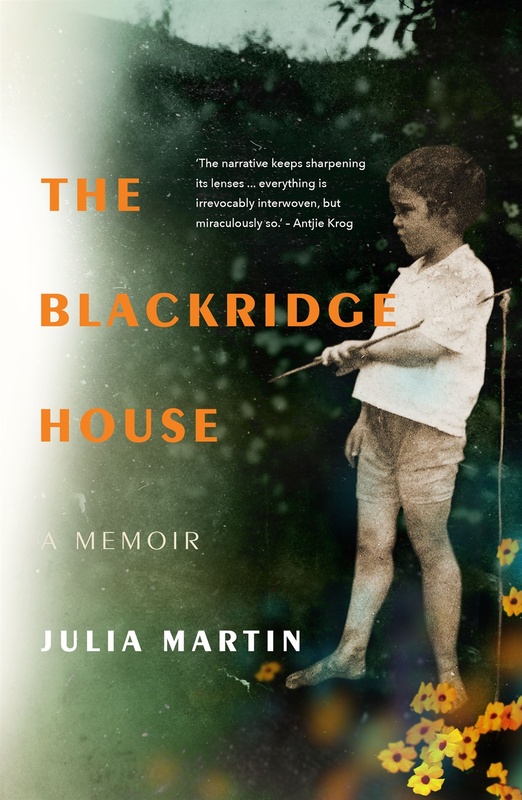 Her daughter, Julia Martin resolves to find the Blackridge house and subsequently wrote a book about her journey. The Witness' Yves Vanderhaeghen interviewed her about the book. YV: It was a wish on the part of your dying mother that set you off on the quest that forms the story of The Blackridge House: that you should find the childhood home of her memory, for which she had no street address or title deeds, and bring back to Cape Town something living. Why was it so important to you? JM: I don’t think she was actually dying at that point, except in the sense that we all are. But yes, she was very old and her memory was confused. In that state of mind, the Blackridge house and garden became really iconic. So when I suggested the idea of looking for the place, she was delighted. I suppose it began for me, quite simply, as something to do. Part of what is so painful about dementia is the way it tends to render everyone else powerless. You wish there was some way you can help, but you don’t know how. So the book opens with what is a personal crisis for both of us, and the quest is then a response to that. Quite soon, I realised that the journey to find the house was about much more than just locating an address. If we allowed it, the process could open up myriad conversations, and the personal story become the lens for a larger story about the region itself. YV: Inevitably the book is not only about a house, or a place, but about belonging. Your mother had only lived at the Blackridge house for eight years. The last 30 years of her long life were in Cape Town, the last of which were in an old-age home she described as a cage. Why do you think she kept returning to the memory of her formative home? JM: At one level, it could have had to do with brain function. We’ve all known older people whose memories of childhood are still bright, even if their more recent memory doesn’t work too well. From what I’ve come to understand, this may be because those earlier ‘remote’ memories are being stored elsewhere in the brain, and can be retrieved without using those parts which are affected by the dementia. More specifically, it turns out that one of the recurring features of people suffering from dementia is a longing for home. Even if they still are living, literally, at home. It’s not difficult to imagine why. Anyway, that’s one kind of answer to the question. My mother’s responses were more lyrical and subtle. She spoke about togetherness, family, a best friend called Cyril, a vast wild garden with trees to climb, a little stream to paddle in, mealies and grapes and mangos to pick and eat, bats and bush babies awake in the night, beloved dogs and a cow and even a horse, and the freshness of the child’s mind to experience it all. Blackridge, as she remembered it, was paradise. It was home. Looking back, I see the place as the imaginative seedbed for the rest of her life. Who wouldn’t want to return? YV: Read as a memoir, there is a strong sense that you present your family history as a confluence of private, public, circumstantial and historic events. This is my reading, and you seem to prefer the metaphor of patchwork lives. How do you see all the bits and pieces coming together? JM: Yes, a confluence of all those things and more, though the idea of a patchwork doesn’t quite do it for me. I’d rather imagine a weaving, a mesh, a living web. We’re calling the book a memoir, but it’s really not about individual lives. It is about individual people, but of course what you find when you look closely into any life, any life form, is that it’s inextricably woven with all the others, the whole ecosystem. The personal is the (eco) political. So, in a sense, those bits and pieces don’t have to come together. They are already together. That said, interconnectedness is not always self-evident, and it was a fascinating part of the project to be a witness to some of these processes at work: how one particular person’s story is threaded with history, and how the life of one particular neighbourhood has a countless multitude of global flows tracking through. YV: I found the book to have a meditative quality, a serenity which belies the distressing, traumatic aspects of its subject matter: your mother’s dementia, your own heartbreak as she slipped away, the sense of loss, our country’s history. How do manage that? Is it rooted in an underlying philosophy or spiritual view of the world? JM: I think it’s fairly common to find that experiences of suffering which you would never ever choose may turn out be instructive, even a mysterious kind of gift. So in Buddhism there’s a helpful recognition of this when Old Age, Sickness, and Death are referred to as the Three Divine Messengers. Why? Because their unwelcome appearance has the capacity to wake us up. During my mother’s last years, the big three sort of came to stay. It was very painful, and also extraordinary. Anyway, that’s at the personal level. I imagine that some kind of engaged equanimity in response to social injustice and environmental suffering would mean taking a very long, long view of the present crisis: a view in which one’s best action accepts the possibility that our species looks set to have a fairly short run. YV: Following on from that. A central theme in the book is things which are broken, and how, if at all, they are put back together again. There is your mother’s broken memory; the earthenware pots reconstructed from excavated shards which tell the story of Pietermaritzburg before colony, before your family; then there’s your own effort to reconstruct a half-remembered Zulu lullaby which your mother sang to you as a child. Is this you putting something back together for yourself, a healing? So yes, there is much in the book that is broken. And yes, like Walter Benjamin’s angel of history, you wish you could fix things. But after a while you realise, of course, that it’s not going to happen like that. That things really do change irrevocably. That impermanence is actually the inescapable condition for life. And healing, when it does take place, is not about going back. *This is a shortened version of an article first published in The Witness.